If you could turn back time and stop an unforgivable tragedy from happening, wouldn’t you? Blessed with an unexplained ability he dubs “Revival”, Satoru Fujinuma often finds himself travelling five minutes into the past when something wrong is about to happen and he needs to fix it. Where this capability stems from is unclear, but it seems linked to the death of his classmate Kayo Hinazuki in 1988. Although his memories of that time are hazy, Fujinuma still feels a sense of responsibility for not offering to walk her home on the day of her disappearance, and this sense of guilt can still be felt in his adult life 18 years later. He lacks purpose, and any motivation he may have had as a child is now stilted. A spark ignites in Fujinuma when his mother reminds him of that dark year when three children were taken and murdered over the course of a few days. Although the police believe they caught the right man, he is convinced that the accused is innocent. When one of his “Revival’s” leads his mother to discover the true killer’s identity, and then pay the price for it, Fujinuma finds himself thrown back into his 11-year-old body days before Kayo’s death. In order to save his mother, he must first save her. What follows is an intense and emotional murder mystery. Fujinuma must fight against the clock to save the day, and his first goal is to befriend Kayo so that she’s with him at the time of her original death. When he is first transported to 1988, Fujinuma is understandably disoriented. Everything is shown from his point of view, and director Tomohiko Ito often uses his eye-level as the base for a scene. The audience is forced to discover things at Fujinuma’s pace, and getting to hear his adult voice while seeing his 11-year-old self serves up much of the show’s comedic moments, especially when he interacts with his mother. He spends time at home, starts building relationships with his classmates, and works towards saving Kayo from her abusive family life. Despite his best efforts things don’t go according to plan as the girl still disappears. If there’s one message that Erased is trying to convey, it’s that we need to learn to accept help and trust one another. Since his first attempt fails, when he does return to 1988 he decides to confide in his friends Kenya and Hiromi. This change is an important part of Fujinuma’s character arc over the series. It’s the changes he goes through that gives him the ability to fix the past and save the day, he becomes more courageous and it’s especially thanks to the support of those around him that he is able to learn. It’s also these episodes that are the most powerful. When set in the past, Tomohiko Ito approaches the story with great skill. Seeing Fujinuma put the pieces of the puzzle together, and interact with those around him, gives the series a real emotional depth. It’s when subjects are tackled in a less subtle way that things start to falter. Even if the killer’s identity isn’t hard to guess, it’s a shame that Ito decides to depict anyone remotely suspicious as being inherently evil. Their eyes burn a deep red and the music becomes increasingly dramatic when they are onscreen, it’s over-the-top and detracts from the shows strengths as a whole. 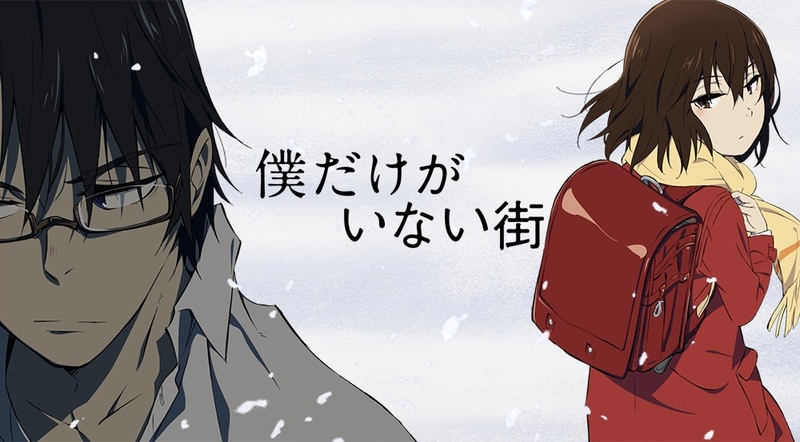 While the series does have its ups and downs, Erased is a solid murder mystery. Featuring some excellent twists along the way, the show is at its best when stuck in the past. It leads to some of the more emotional challenges for its lead character, and to see him grow over the course of the story is the most satisfying of all. His dynamic with his mother and the girl he’s desperate to save provide some great moments onscreen, and had the series not overused melodramatic tropes to present unpleasant people and topics it probably would have been flawless. Erased is released in the UK by Anime Limited.